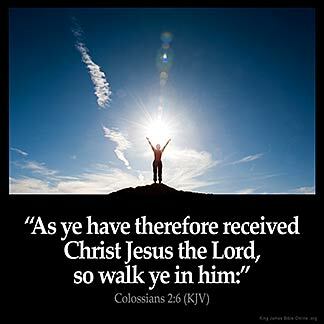 COLOSSIANS 2:6 KJV "As yee haue therefore receiued Christ Iesus the Lord, so walke yee in him:"
2:6 So walk in him - In the same faith, love, holiness. Col 2:6 Walk ye in him. Continue to live in, obey and believe upon Christ as he was first preached to you.